The melody seeped into my REM cycle, making me just lucid enough to believe someone was singing a cappella outside my window. But my sleep-clouded brain couldn’t make out the words and I didn’t recognize the voice either. Besides, I wasn’t aware of anyone who might want to serenade me (although, you never know). Slowly, as I became more conscious, it dawned on me that although this was definitely a love song, I was not the target audience… or even the target species. When awakened by birdsong, it’s natural to assume that it is actually dawn, even when it feels like mere minutes since your head hit the pillow, so as I surfaced from beneath the quilt I winced in anticipation of bright light. The singing blared like a desert sun, but the room was dark as the inside of an acoustic guitar. A moment’s confusion, followed by a quick glance at the alarm clock—1:40am—and I confirmed not just the identity of the vocalist but his predicament as well: a young male northern mockingbird with a lonely (or maybe just randy) heart. Mockingbird men can’t rely on flashy plumage to catch a potential date’s attention because they share the same understated but distinctive grayscale wardrobe as their women. But the name, Mimus polyglottos, says it all—”mimic of many tongues.” Songbirds often have a brief window of opportunity during their youth when they learn their species soundtrack. The males later use that imprinted tune to practice their pickup lines, and the females recognize potential mates based on that childhood template. 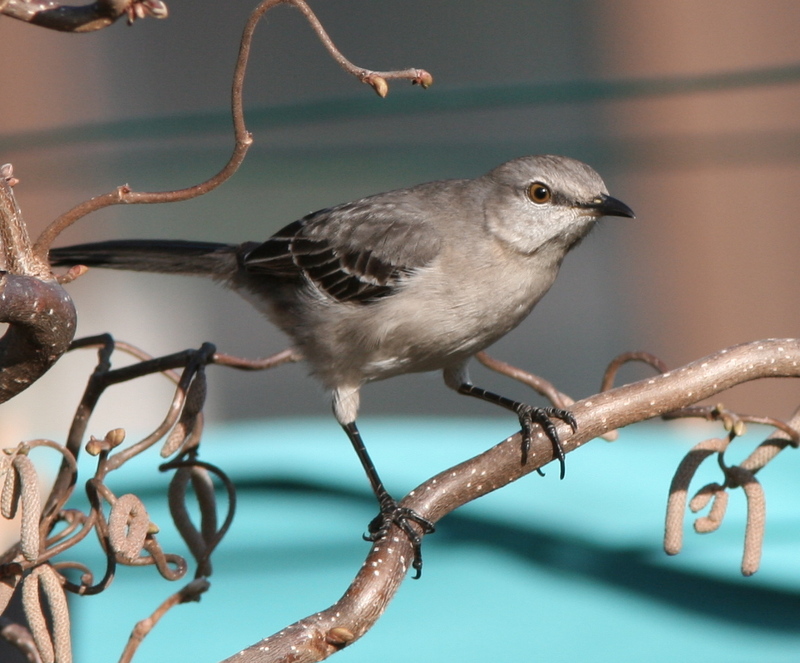 Mockingbirds, however, are not one-hit wonders. These guys are dedicated to expanding their repertoire, learning as many as 200 songs over the course of a lifetime. And the dolls eat it up like candy… or make that cucumber beetles. A male leaves his winter habitat and begin tuning up in early February, attempting to establish a nesting territory before the gals arrive. Once he finds his seasonal significant other, he turns down the volume and his songs become shorter. Female mockingbirds sing too (a trait that’s fairly uncommon among songbirds), although not as loudly as the males and seldom during the breeding season. Raising small children is a all-consuming endeavor, or so I hear, that doesn’t leave little much time for recreational pursuits. Unpaired males, on the other hand, have both the time and the motivation to keep singing, almost to the point of obsession. They keep looking for love, and belting out ballads, until late in the season. Which is exactly what was going on outside my window this morning. Now, normally, I’m not only a fan of birdsong, I’m a pretty empathetic individual as well, so my heart went out to that poor, single-minded, solitary soul. If this night music keeps up, I may have to strongly suggest he try a new approach. I could recommend a helpful online dating site. © 2011 Next-Door Nature— no reprints without written permission from the author. 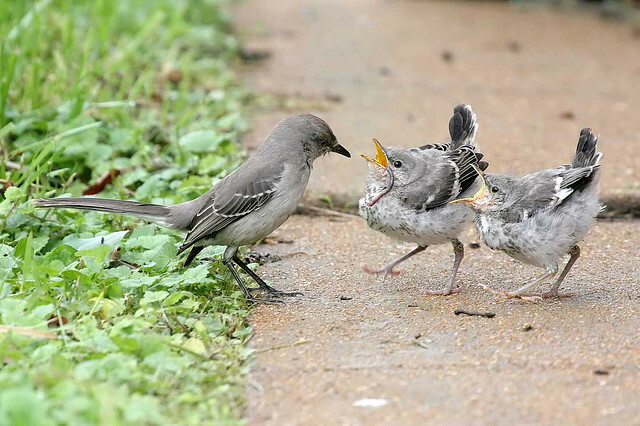 Thanks to Melvin Yap for making his photo of an adult northern mockingbird feeding two fledglings available through a Creative Commons license. This entry was posted in behavior, birds, clues and signs, human-wildlife conflict, natural history, nesting behavior, northern mockingbird and tagged animal behavior, bird song, birds, breeding behavior, hidden nature, hidden wildlife, Mimus polyglottos, natural history, Nature, northern mockingbird, postaweek2011, songbirds, suburban wildlife, urban wildlife, wild birds, wildlife by Kieran Lindsey. Bookmark the permalink. I loved this story of the lonely mockingbird outside your window, but he could have been more considerate with the time he chose to sing his songs for a mate! Ah well . . . the path of love is never straightforward as he is discovering. Thanks for all the info on the mockingbird – stuff I never knew. So glad you enjoyed this post! You may be interested to know that the early morning jam sessions have stopped–either he found a match or decided to try another venue! heh heh. too cute. We had a mockingbird in Quebec City and I loved that he visited us every year. However, had he sung at that time of day, eh night, I would have had to have words with him for sure! Amazing how much sound can come out of that small throat!